Scottish settlers in Cape Breton have maintained traditions of instrumental dance music since the time of the highland clearances, a period which coincidentally coincided with the Golden Age of Scottish fiddle music. This collection presents older Scottish fiddle music from the era 1740-1935. The settings of these tunes pay respect both to the composers' intentions as given in classic Scottish published collections, and to the Cape Breton traditions which have given this music new life and caused it to evolve. Samples of music from the book. complete with chords and footnotes (showing Cape Breton sources). Mrs. Ross's Reel - A William Marshall tune mis-identified ? You know how when listening to any medley of Cape Breton tunes recorded in someone's kitchen in the 1950s there is often one tune that jumps out right through the layers of sonic mud typical of a dub of a dub of a dub? And as it replays in your mind for two weeks you can't shake the tune but you also can't quite learn it because most of the third line is obliterated by the sound of a teapot falling on the piano and when at last you learn the title and are able to trace the tune to an 18th century Scottish tune book, it turns out - if you can find a copy - that the book version isn't quite the same as the tune on the recording? I have good news for you. Three hundred and eighteen of just these sort of tunes, in their Cape Breton versions, have been gathered, edited, and printed clear and large by Paul Cranford in the eighth volume of his Cape Breton Musical Heritage Series. 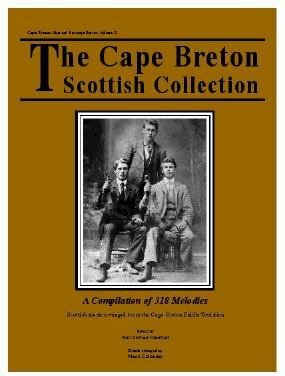 "The Cape Breton Scottish Collection" is exactly what the title suggests. All the tunes originated in Scotland. Most are in old tune books in somewhat different versions. A few are from aural tradition, and all are presented in Cape Breton versions gathered from one or another great fiddler and sometimes expertly assembled in a compatible whole from the disparate versions of several fiddlers. Every tune is followed by annotation of source(s) and sometimes by historical and/or anecdotal information as well. This adds depth and dimension to the book users' experience. Several introductory pages of well-thought-out history and philosophy give context and further meaning to the music. There are 120 pages. Tunes are organized according to key. There is an alphabetical index. I haven't found a tune in this book that I don't like. I was happy to at last find the titles of tunes I've been hearing for years, amused to find printed versions of tunes that accord with settings that I arrived at independently, and delighted to find improvements to my settings of other tunes. There are also plenty of good tunes in this excellent book that I've never heard before. Chords are given for each tune. Perhaps they are meant to clarify melodic editing choices. I find the chord choices viable but not inevitable or inviolable. They are printed large enough to see and small enough to ignore. Finding just the right size to print the chords is typical of the care that went into putting together "The Cape Breton Scottish Collection". I recommend this book to anyone interested in Scottish fiddle music.